Lamar stays perfect in Southland with win at Abilene Christian. 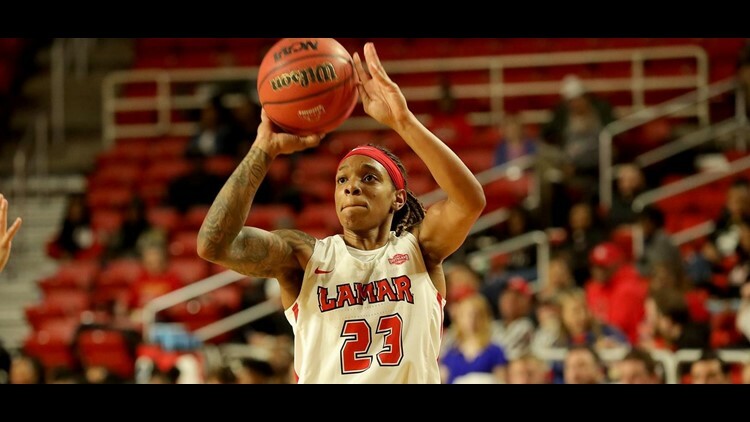 The Lamar University Cardinals trailed by eight, 42-34, entering the fourth quarter, but Lamar's offense woke up and scored 29 points and came back to earn its 12th win in a row with a 63-60 victory over Abilene Christian on Wednesday night in Southland Conference action. With the win, the Cards improve to 17-4 on the season and 10-0 in SLC play, while Abilene Christian falls to 14-7 and 7-3 in SLC action. In the fourth quarter, the Cards were 8-for-12 from the floor, including going 5-for-8 on three-pointers. LU sealed the victory at the free throw line where they went 8-for-10. Lamar forced ACU into five turnovers in the quarter and did not commit a turnover. "We played really well in the last six minutes of the game," remarked head coach Robin Harmony. "Our kids kept their composure and hit some big-time shots as we were down nine in the quarter. Chastadie, Moe, and Angel all hit big time three-pointers for us. Coming into Moody Coliseum is always tough and it's a tough place to win and we played a good team and we are glad to come away with the victory." The Cards had four players in double-figures led by Moe Kinard who scored 18 points on 6-of-12 shooting. Chastadie Barrs followed with 13 points. Miya Crump and Briana Laidler rounded out the double-figure scores with 11 points apiece. Barrs recorded five steals in the contest and now has a steal in 112 straight games. She has 580 career steals. The Cards offense came out cold as they were held scoreless for the first three minutes of the contest and Abilene Christian took a 5-0 lead. Lamar's first field goal came with 6:18 left in the first quarter as Miya Crump hit a jumper in the paint. Over the first four minutes of the contest, the teams combined to go 3-for-17 from the field. The Cards did not hit another jumper for three minutes until Jadyn Pimentel hit a three. Laidler hit a layup to put the Cards down two, 11-9, after one quarter of play. After falling behind by five, 14-9, in the second quarter, LU's offense started to heat up. Kinard hit a layup putting the Cards down two. After a bucket by ACU, Kinard hit a three-pointer, tying the game at 16. LU took its first lead of the night after Laidler went 1-for-2 from the line. The game remained close in the second quarter and with 11 seconds remaining in the quarter, Laidler gave the Cards a three-point lead, 27-24, which they would take into halftime. The Cardinals offense cooled off in the third quarter of the contest as they went 3-for-13 from the floor in the quarter. LU was held scoreless for the first four minutes of the quarter. Lamar's first basket came with 3:36 when Barrs hit a layup putting the Cards down two, 31-29. Big Red hit two more field goals in the quarter and trailed 42-34 after three quarters of play. Early in the fourth quarter, the Cards found themselves down nine, 47-38, with 8:45 to go in the contest. Kinard hit a three putting LU down six, 47-41, and the Cards continued to mount a comeback. After a pair of free throws by Kinard, LU trailed by three, 47-44, with 6:11 left in the contest. ACU extended the lead back to five, 49-44, but the Cards did not go away. LU's Crump hit a huge three with 5:47 left putting the Cards down two, 49-47. The lead grew to five, but the Cards answered right back as Barrs and Angel Hastings hit back-to-back threes and LU took a 56-54 lead with 4:23 left in the contest. The game would be tied two more times, but the Cards never trailed again and sealed the win at the free throw line. Lamar came away with a 63-60 victory over ACU for its 12th straight win. The Cards return to action on Saturday, Feb. 9 when they travel to Nacogdoches, Texas to face Stephen F. Austin. Tipoff is set for 2 p.m. from William R. Johnson Coliseum.